Galatea is active on the East Coast, often meeting up with other Albert Strange boats in the region, including Firefly, the boat owned by Jamie Clay and a design collaboration between Albert Strange and Harrison Butler. Interestingly, Galatea used to be owned by Ed Allen, who sold her in 2007, and shortly afterwards became custodian of the Harrison Butler designed Z4, Zircon. 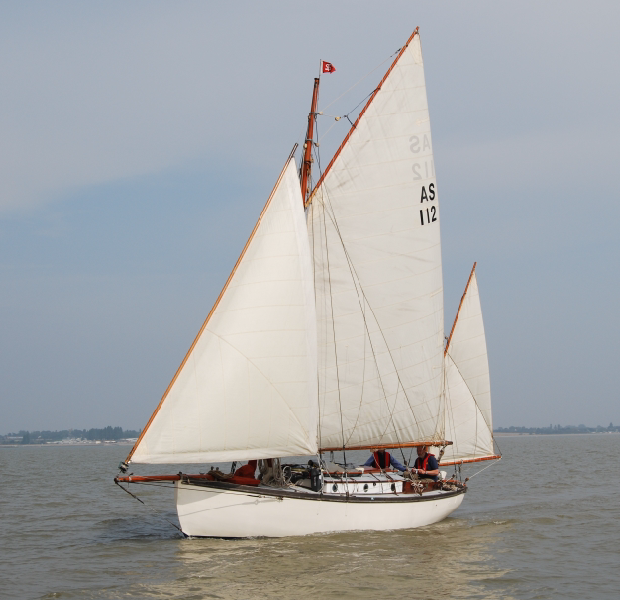 Current owner, Gordon Scott, has this to say about her; “She's a 1910 design, the transom version of design number 112 which, in its canoe sterned version, is known as Cherub III, Albert's own last boat. Although designed as a gaff yawl, she was built as a gaff cutter, presumably similar to her sistership Ariel. Sometime, probably around the 1950s or 1960s, she was converted to Bemudian cutter, in which form she came into the hands of Richard Blomfield, who looked after her for over 30 years. Richard maintained her in traditional and authentic style and around 1996/7 had her rerigged as per the original design ... as a gaff yawl, including the 1910 design roller reefing spar on the jib. That and other work, such as a new transom, was done by Alan Staley at Faversham in Kent”. She's a grand looking boat, that one day I hope to step aboard, but in the meantime will continue to admire from afar.